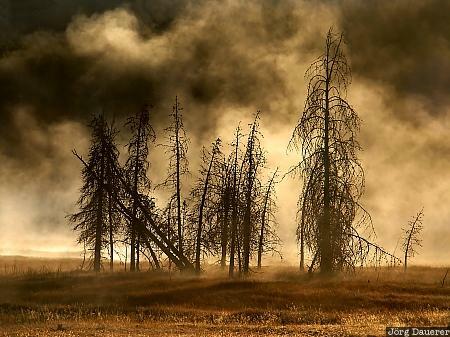 Dead trees and early morning fog seen on Firehole Lake Drive in Yellowstone National Park. Yellowstone National Park is in the north-west of Wyoming in the western part of the United States. This photo was taken in the early morning of a sunny day in September of 2003. This photo is part of the exhibition Landscape Fog (October 2008). This photo was taken with a digital camera.